The general cargo ship Bhaita Jaya Samudra sank after collision with motor tanker Elizabeth in the waters near Damar Island in North Jakarta, Indonesia. The freighter, which was carrying explosives on board, started getting water ingress from the breach in the bow port board. The accident was reported to the local authorities and at the scene were sent rescue teams, which evacuated the 19 people (16 crew members and 3 guards) from the sinking vessel. The salvage operation was complicated and the local authorities failed to stop flooding of the general cargo ship. Later during the day, the vessel completely submerged, resting the bottom. The motor tanker Elizabeth was carrying CPO waste and during the collision was breached in the starboard, suffering water ingress, but remaining afloat. The salvage operations are under way. 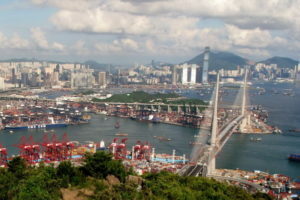 There were no reported missing people or casualties, but only two injured seamen during the accident. They were hospitalized for medical treatment, but without serious injuries. The general cargo ship Bhaita Jaya Samudra (IMO: 8713108) has deadweight of 1600 DWT and gross tonnage of 675 GRT. 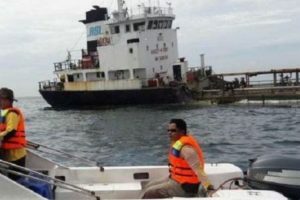 During the accident, the vessel was en route from Sunda Kelapa Port towards Tanjung Balai Karimun carrying military explosives and various consumer goods. Indonesian-flagged MT Elizabeth has gross tonnage of 675 GRT. During the accident, the vessel was en route from Bengkulu Port to Marunda Port of North Jakarta.